It’s Gorgeous George! And he was in Amsterdam within the past couple of days. 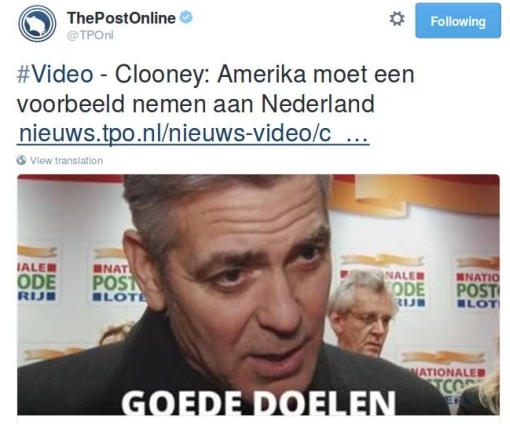 The Dutch news/commentary website “The Post Online” took appropriate note and recorded about a minute-and-a-half of video, which you can access by clicking through. Don’t worry, of course he speaks in English, it’s merely dubbed underneath in Dutch. I feel the need to take exception to a couple things he mentions here. OK then: write more parts suitable for actors of color and hire them – fine. But “the kinds of movies being made”? I thought, when it came to that, it was all about Art – that is, about inspiration, about pursuing deep themes and not about some reasoning-process such as “Hey, looks like we haven’t made a Latino film in a while – time to make a Latino film!” etc. Am I naive here? Probably. We don’t do it in the United States, and we should, it forms this whole sense of community where, like, a whole postcode wins, which is great, but they also donate so much money to so many different actually needy charities . . . . I wish we were forward-enough thinking to do the same thing. Here’s another bit of news that I am surprised has not been reported more – or maybe it’s just that it has only been reported in Spanish and not yet crossed the language barrier. The Law for Party Financing of 2007 prohibited receiving funds from foreign governments but did not impose sanctions on those who evaded this restriction. Nonetheless, last 1 July a reform of the Penal Code came into force which prescribed up to four years’ jail and fines of up to five times the amount of the donation received by formations gaining more than 100,000 euros from another country . 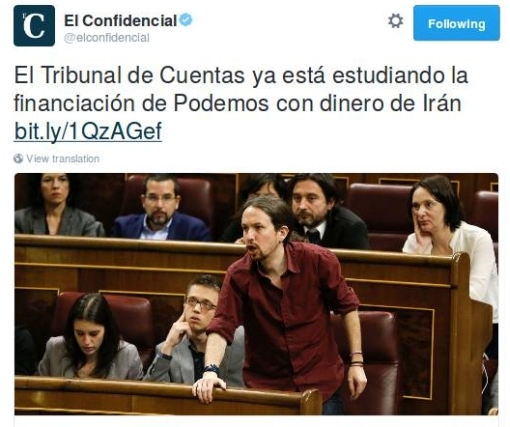 . .
Podemos is alleged to have received €5 million from Iranian sources, and undisclosed other amounts from the Venezuelan government. Further, Pablo Iglesias, Podemos‘ leader, is alleged to have received personal payments of between €2,000 and €3,000 numerous times. Again, Hispan TV was used as the main vehicle to move these monies and make things look legal, through inflated invoices and the like. All this is coming to light now – allegedly – because a Venezuelan government insider with knowledge about what has been going on has started talking to the DEA. The affinity between Podemos and the Venezuelan government is easy to see: both are left-wing. But neither are Muslim; indeed, there has not been a strong Muslim political presence in Spain sine 1492. So why would Iran want to buy influence in an up-and-coming force in Spanish politics this way? For that matter, what is the Iranian government doing in the first place splashing out the cash for a television network to push it views throughout the Spanish-speaking world? And, really, why haven’t we all heard a lot more about this? Could it be just a journalistic hack-job from a media outlet, El Confidencial, that is hostile to Podemos‘ politics. I have to confess that I really do not know; for what it is worth, El Confidencial seems quite a newcomer to the Spanish media scene, and I’m not even sure whether it has or ever had a paper/sold-on-the-streets version. Still, as hinted above, the Spanish political situation remain in limbo after that December 20 election because, for the first time, no party won a majority enabling it to govern alone. The parties which did well (including Podemos) have been thrust into the very unfamiliar task of forming a coalition government, something that has never been required before in post-Franco Spain. They are not doing well at it so far; and if it turns out that they can’t work things out, then there would have to be new elections. That is when these allegations – if true – would start to really bite for Podemos. 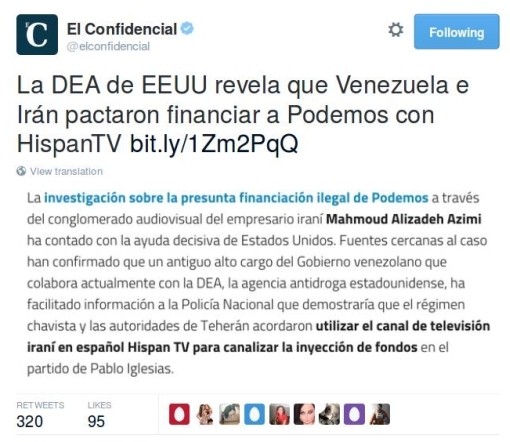 The facts at issue are pretty much as described in the initial blog-post (above): “the alleged illegal financing of Podemos via Iran’s television station in Spain,” although in this piece there is no mention of Venezuela. So on the one hand this would seem to lend credibility to the accusation; on the other hand, this is once again a report from that same source, El Confidencial. A story about Prague . 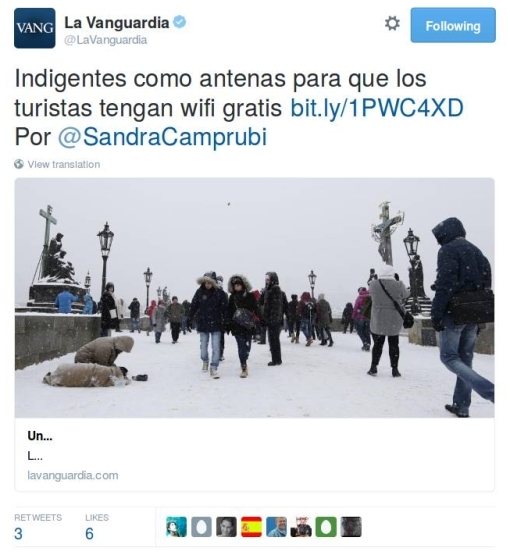 . . from the Spanish press, from La Vanguardia – but Twitter is a many-splendored thing that way. But first, just appreciate the photo, taken on Prague’s Charles Bridge about a week ago – the statues, the ice-fog in the background so you can’t even see any sky. What is of significance here is the figure at the lower-left: the beggar crouching in the snow. An enterprising young Prager by the name of Luboš Boleček has come up with an innovative way to help such people. They spend a lot of time hanging around on the streets, right? At the same time, other people walking in those streets – people with the wherewithal to own a smartphone – are frequently in search of a WiFi signal, right? I suppose those inclined to look on the bad side might dismiss this project as an abuse of the homeless as a sort of city furniture – or some such – for visiting tourists. In Boleček’s reasoning, however, it is much more along the line of the “homeless newspapers” you often find such people peddling on the street: again, an escape from merely begging outright for money in favor of attempting to offer some real value-added in return. Maybe it’s time to update that “homeless newspaper” paradigm, he suggests: people don’t read much anymore in any case – at least not anything on paper – so the rationale for such newspapers is fading and it’s time for something new. Boleček’s project is admittedly off to a stuttering start, as he is still looking for private or public funds to enable him to fully get going with it. As he says himself, you’d think some telecommunications company would be glad to step in as a sponsor. Anyway, you can learn more about it on the website he has set up, which is also in English. Take a good look at the below tableau: Such a scene of triumph and female empowerment, smiles all around, the Russian flag wielded like a blanket and the (bizarre, disjointed) logo of the 2012 London Summer Games looming off to the left. 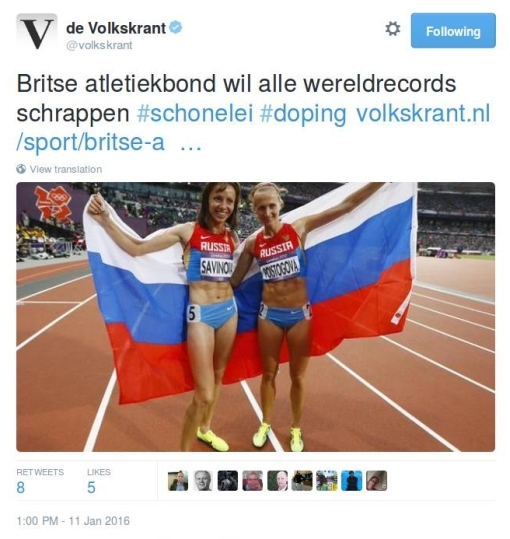 Greater transparency, tougher sanctions, longer bans – and even resetting the clock on world records for a new era – we should be open to do whatever it takes to restore credibility in the sport. And at the heart must be a proper and appropriate funding regime for the anti-doping authorities to help confront the new challenges they face. Clean athletes the world over deserve nothing less. This has involved measures such as reducing the independence of the Supreme Court equivalent there, but what has caught the eye most has been the law recently pushed through the Sejm (the lower house of parliament) which converted the State radio and TV institutions from commercial organizations wholly owned by the government to governmental institutions – thus liable to having their top staff chosen by the government of the day. Once this law was passed and signed last week by the country’s president (also PiS), the government lost little time in putting in its own people. As usual, I’ve tried to track that via my regular review of the Polish press, so that I can then pass on interesting bits of what was going to you via tweet and/or blog-post. But now that the law has been passed – and the Polish government and EU Commission have set out their antagonistic positions about it – what seems most interesting is a tweet I first picked up from last November, when the PiS government was getting ready to take power. 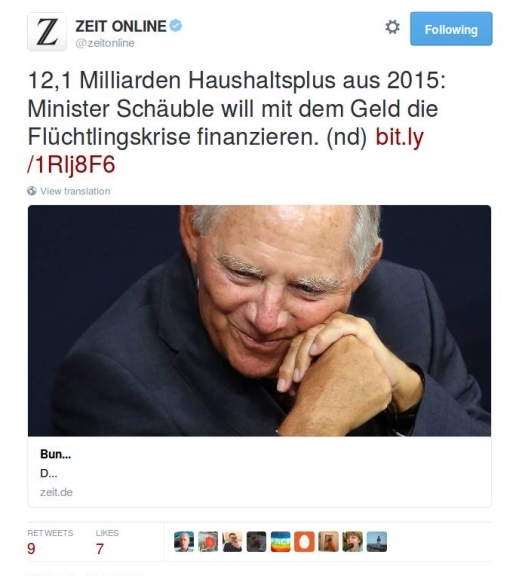 Here we got a first warning, from the influential Munich newspaper Süddeutsche Zeitung, of the intentions of the incoming PiS government, in particular of Piotr Gliński who became Minister of Culture. Note the emphasis: “cut down on foreign influence” – now, what sort of “foreign influence” could there be within the State radio and TV institutions? As mentioned, even before the new law they were 100%-owned by the Polish government; some variation of this is the rule with all other European State broadcasters. So what could they mean by “foreign influence” – perhaps the foreigners who happen to work there? No, that’s not it (although it wouldn’t be any surprise if the new bosses at TVP and Polskie Radio do fire the foreigners); rather, we’re speaking here of the print media. 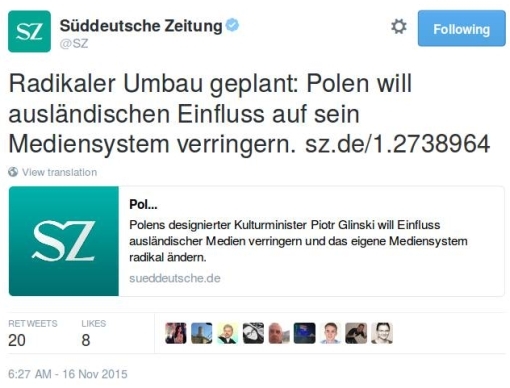 In Poland that is mostly foreign-owned (and that mainly from Germany) and Gliński wants to do something about it. The new government wants to “change the ownership proportions” of local newspapers, Gliński said. To do this, they are considering “buying back” shares owned by foreign publishing companies, founding native Polish newspapers or further building up those fully Polish-owned papers that now exist. For Belgian casinos – all nine of them – are in trouble, mainly for the usual reason of fierce online competition. One can always smoke at home (if the significant other there agrees), in front of the computer. If something is not done, argues Gambling Commission Head Peter Naessens, then punters will stay there to place their bets or, if they really desire that on-site gambling experience, will simply cross the border, presumably where they can both gamble and smoke. So the proposal is to put in an exemption to the general smoking ban for enclosed public places of July, 2011, and thereby allow smoking again in Belgian casinos – that is, allow people to ruin their lungs (for the cigarette-makers’ profit) at the same time as they ruin their finances (for the casinos’ profit). This is really depraved; and both of these are potentially addictive behaviors! This week sees the qualification rounds, to be held in Berlin, for the volleyball competition that will be part of the 2016 Rio Olympic Games later this year. The German team coach, Vital Heynen (himself of Belgian nationality, as you can perhaps tell by the name), has a lengthy interview in the leading German newspaper Die Welt. The problem of Germany is that it is no sports-country, it has no sports-culture. 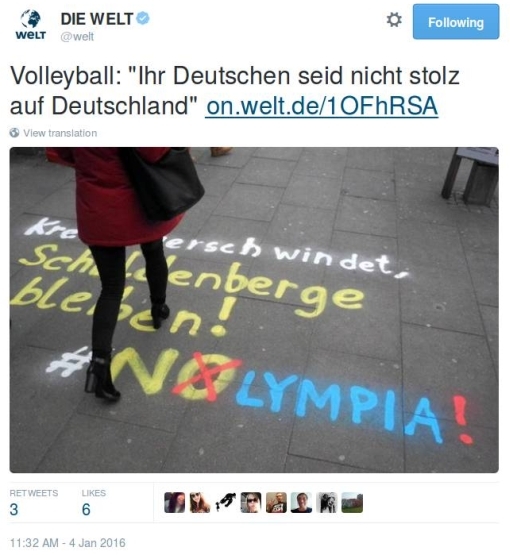 Hamburg’s decision to not apply for the [Olympic] Games [of 2024] hit me right in the heart. I cannot understand it. 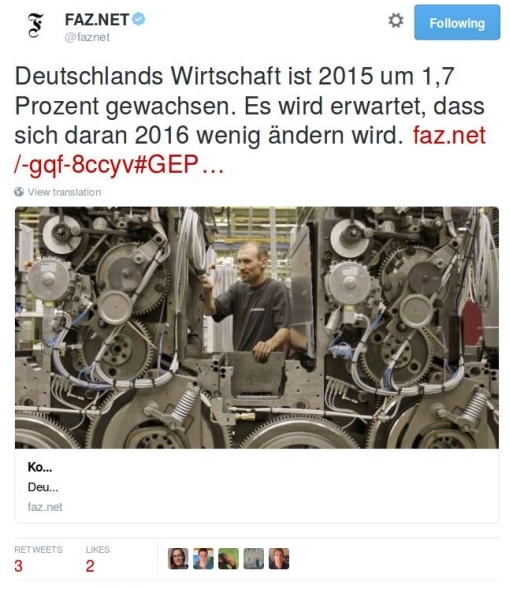 The Olympic motto for 2012 was “Proud of Germany”; I’m telling you now, you are not proud of Germany, when you have a country of which one really could be proud. No “sports-country”; no “sports-culture.” Because the German taxpayer has picked up a new reluctance even to bid for the right to host Olympic games! Heynen may think that his position gives him a privileged platform to comment on German athletic affairs generally, but he is likely wrong. The citizens of Hamburg voted last September to withdraw their bid, but those of Boston had done the same thing just two months earlier. Indeed, is staging the Olympic Games – whether summer or winter – something any reasonably democratically run polity is going to want to undertake from here on out? It’s an awful big drain on public monies, all for a bit over a month of concentrated world-attention – and then the long hangover of an expensive collection of white-elephant athletics buildings for which permanent alternative uses are hard to find. The 2004 Games certainly gave Greece a good shove down the path of public insolvency, while there has already been and will certainly continue to be widespread dissatisfaction in Brazil over all the public money spent on this year’s Summer Games, especially given the recent sharp downturn in Brazil’s economic fortunes – and given the strong whiff of public corruption whose revelation has accompanied that downturn. Clearly, staging the Olympics is a project not for democratic localities but rather for the undemocratic variety, where there is no public accountability for the vast sums of public money required. The 2014 Sochi Winter Olympics – the most expensive in history, by far – clearly had as their main function being a conduit for Putin to divert government money to his friends and supporters. The 2008 Peking Games, for all we know, fulfilled a similar function, as will surely the 2022 Winter Games, also to be held in that world-renowned center for winter sports, Beijing. Of course, even if the democratic world sensibly starts to leave hosting the Olympics to the autocrats, that still means condemning a series of national populations to misappropriation of their tax monies. Far better to harken back to the Games’ original spirit, to the very name Olympics, and start hosting the Games (at least the Summer version) permanently in their spiritual country of origin, namely Greece, in Athens. There is a good collections of purpose-built buildings still there just dying to be properly used again. 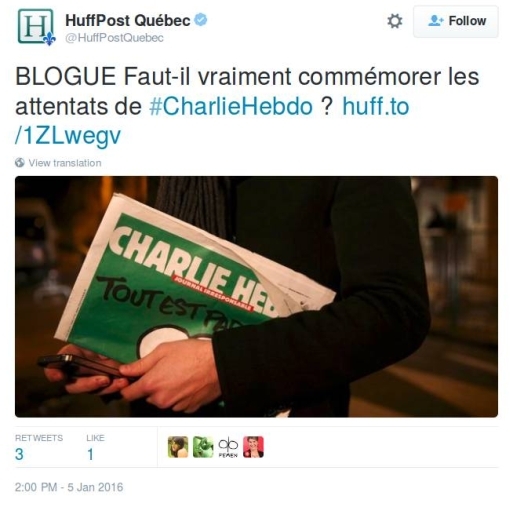 You are currently browsing the EuroSavant weblog archives for January, 2016.